Do you like games with cars? Most of actual car games are either arcades or race simulators, but BeamNG.drive game is as different as DeLorean DMC-12 would have been in 2018. But this time traveler must be from a far future when digital cars have been made real. At least, real enough to calculate real crashes with them instead of physical ones. Wanna try that? If you have got used to racing games with starts, finishes, and rewards, you’d be a little surprised. BeamNG.drive is 3 GB of pure process. There are several maps you can explore without any given purpose: drive because you can. It’s up to you whether to be a decent driver or to smash everything you can reach. Both ways have their pros. There are also scenarios, and they are rather simple: all about getting from Point A to Point B in time. Campaigns include several simple scenarios and require achieving the score in several disciplines (driving, timing, crashing). You can even try to master bus driving, with all its specifics. But what you’ll need to acknowledge is the game physics. The developers applied the new engine that offers its own physical representation of real objects, including cars. The virtual copies consist of hard carcass and soft covering, imitating the real structure of objects. This is called “soft-body dynamics”, and due to constant physical calculation, the game provides the most realistic movements and collisions. In fact, this is the best part of it. Alas, the game is so far in 2018 available for Windows only. And its developers took for granted that Windows users don’t have to own a gaming controller. So all the controlling elements are the keys. In fact, you only need the arrow block. The up and down arrows are used for acceleration or slowing down, the left and right ones simulate the steering wheel. The rest is meant for calling menus and returning to previous screens. You can even leave your mouse idle. One keyboard is enough, and online features are not necessary. There’s no local or online multiplayer mode, so all competition is limited to leaderboards. Not much of a racing game, but OK for a simulator. Does it make any sense waiting for BeamNG Drive for Mac? Probably yes. The game has attracted a lot of attention from cinema and animation professionals because its engine is great for pre-calculating car stunts. And these specialists are fond of Apple devices. If so, it can be logical to once download BeamNG Drive for iPad Pro directly from App Store. Still, we’re sure the game is unlikely to hit other platforms. 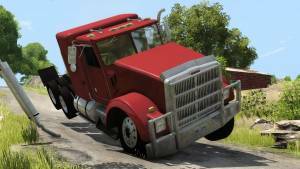 Should we expect BeamNG Drive for Xbox One or BeamNG Drive for Xbox 360? Only if some major publisher takes its time to port it. But it certainly will only hit the actual consoles: making BeamNG Drive for PS3 or older ones is a waste of time. The graphical part is simply good. The environment hasn’t taken much of the developers’ attention, but you should blame it on the cars. These are done as well as can be, and they look as natural as they’re modelled inside. The developers pay much attention to sounds. They even emphasize their work with special videos illustrating renewed sounds of everything – from engines and wheels to grass and sand. As the game is meant for PC only, a good headset won’t provide much advantage against good stereo speakers. 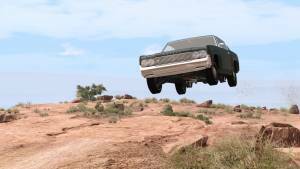 One of the most amazing things about BeamNG.drive is its engine allowing user mods. So the users use it. There’ve been plenty of mods made to introduce new vehicles into the game. The modes are downloadable; the old ones may be incompatible with the actual version of the game. Also, the new engine is for Windows 10 only, and BeamNG Drive for Windows XP/7/8 will not appear unless some fans do the porting. Windows users can download unblocked BeamNG.drive for Windows 10 via Steam or Humble Bundle (links below). BeamNG.drive has no free demo versions, or official torrent packs. BeamNG.drive price (as for September, 2018) is $19.99. Make sure there’s at least 10 GB free space on your HDD or SSD. The installer is quite small, and it downloads the contents from the outside. Alas, BeamNG Drive for iPhone will probably never be here (though we hope for Mac and iPad versions). Android users are a bit luckier: still lacking BeamNG Drive for Android, they at least have its analog, BeamDE, right on Google Play Market. It’s better than search for the original BeamNG Drive APK (that doesn’t exist) elsewhere and find nothing but malware. If you see driving as a meditation rather than transportation, then BeamNG.drive is what you’ve been searching for. Soft-body dynamics is the reason to prefer this one to other driving simulators; you will either live this game for it, or totally dislike for lack of clear mission. Still in its testing phase officially, in fact the game is already being sold, and people are ready to pay for it and even invest their time in modding. 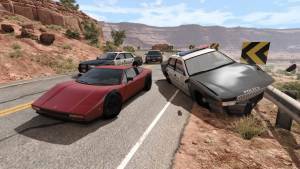 BeamNG.drive is one of the most unusual and most realistic driving (and crashing!) simulators, so, if you use modern hardware, you’re ready to start! 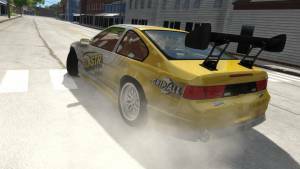 Beamng drive latest version is available for downloading. This links follow to webpage, where you will find links to official sources of BeamNG.drive game. If you are Windows PC user, then just click to button below and go to the page with links. Please note that this game may ask for additional in-game purchases and permissions when installed.